PEB's need special design considerations when used as bulk storage buildings for granular materials. Bulk materials may include wheat, sugar, cement etc. 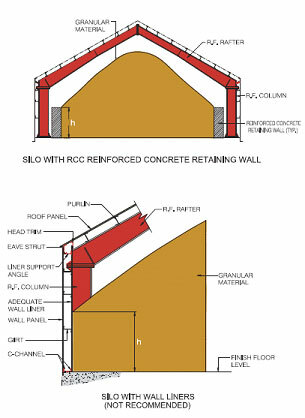 The angle of repose (which is the maximums table naturals lope that a specific material can assume) and the required storage capacity are factors that influence the geometry and design of the bulk storage building. The pressure that granular material exerts on the walls is a function of the material height, unit weight and angle of internal friction. The table below lists these properties for different granular materials. 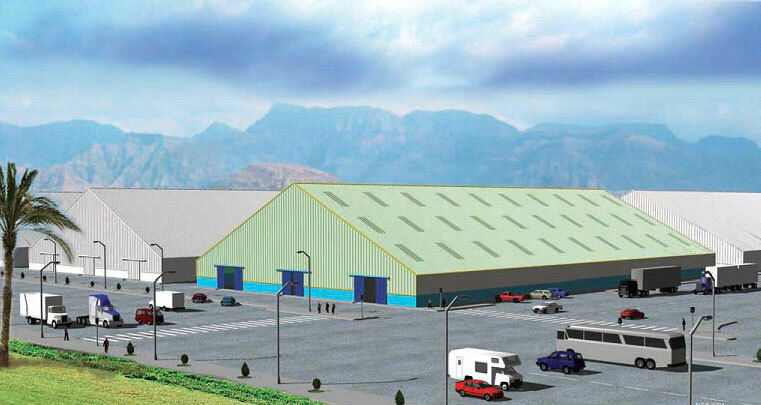 Warehouses/Bulk storage buildings are normally clears pan buildings characterized by a steep roofs lope that permits the efficient storage of piled granular material above the building eave height. If interior metal liner panels are required to resist the horizontal pressure of the granular material, an adequate wall liner panel must be provided to transfer this load to the wall grits and, in turn, to the rigid frame columns.